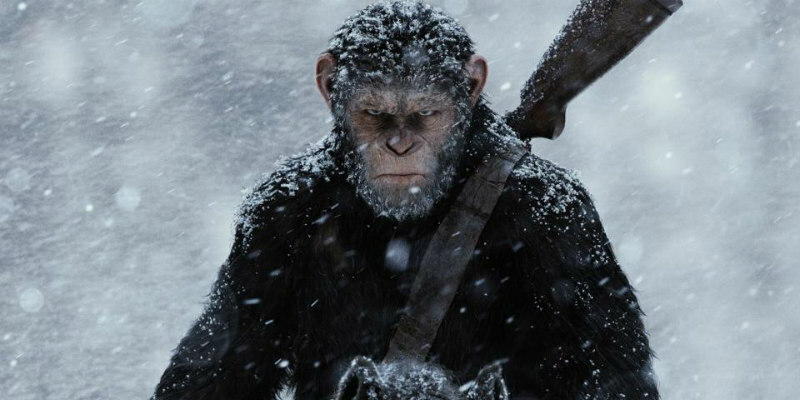 With Caesar back on cinema screens in War for the Planet of the Apes, we look at 10 more of cinema's greatest simians. Undoubtedly the most vicious little beggar on this list, this barbaric baboon causes havoc when he gets loose from a University lab and goes on a killing spree, taking out role players with all his primate cunning. Poor old Ella begins life as a loveable chimpanzee and friend to Jason Beghe's quadriplegic, only to start a campaign of jealousy fuelled murder, killing anyone who dares to get close to Beghe. Raised from infancy by Jill Young (Terry Moore), the 12 foot gorilla heads to Hollywood for a career in the entertainment business, only to end up causing destruction on a drunken rampage. The 1949 original was brought to us by director Ernest B Schoedsack, producer Merian C Cooper and stop motion genius Willis O'Brien, the trio responsible for 1933's King Kong, and the great Ray Harryhausen did some early work here too. The less said about the '98 remake the better. Clint Eastwood isn't a name you associate with comedy, but two of his biggest box office hits paired him up with an orangutan co-star who captured audience's hearts with his cheeky shenanigans. Clint described his hairy co-star as "one of the most natural actors I ever worked with!" Seen in: Too many films to list. First appearing as Johnny Weismuller's primate companion in 1932's Tarzan the Ape Man, Cheeta became a staple of the Tarzan series, later appearing in the '60s TV iteration. Despite hoaxes claiming otherwise, the chimpanzee was portrayed by a succession of different ape performers over the years. With a similar dynamic to his earlier Bringing Up Baby, Howard Hawks' film is another screwball comedy featuring an animal, in this case Esther, a chimpanzee belonging to Cary Grant's scientist, who accidentally drinks from a water cooler contaminated with an elixir of youth. Despite playing against Grant, Ginger Rogers and a young Marilyn Monroe, the chimp holds her own. The late Richard Franklin is one of cinema's most underrated filmmakers, and in Link he gave us the greatest regular sized killer ape to ever grace the screen. There's another dodgy scientist here, this time played by the great Terence Stamp, who along with Elizabeth Shue, finds himself terrorised by Link, an Orangutan with his fur dyed black. Voiced by singer Louis Prima, King Louis just wants to be like you-hoo-hoo, unhappy as he is with his primate status. In the 2016 version, he's voiced by Christopher Walken in a piece of casting genius, and manages to be quite menacing despite his musical proclivities. Played by Roddy McDowell in one of cinema's great make-up performances, Cornelius is the real star of the Planet of the Apes series, playing a key role in the first three installments, and fathering Caesar, who would go on to lead the ape revolution of the fourth film and the recent reboots. Seen in: King Kong (1933) and numerous official and unofficial remakes, sequels and spinoffs. There's really no competition for the top spot. First appearing in the 1933 masterpiece King Kong, the giant ape instantly cemented his place in pop culture history. He's appeared in official but vastly inferior remakes in 1976 and 2005, along with a pair of Japanese monster mashes from Toho studios. The eight wonder of the world recently returned to the big screen in Kong: Skull Island and will return again for 2020's Godzilla Vs King Kong.